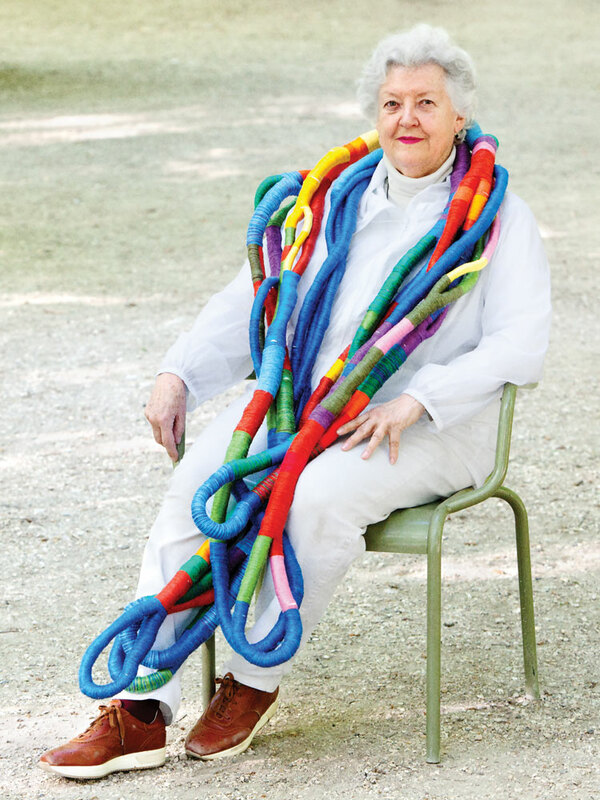 Sheila Hicks is not a weaver. She has been a sorority girl and a synchronized swimmer, an accidental drug smuggler and a magazine editor. She married a Mexican beekeeper and dated a would-be Venezuelan revolutionary. But she is, emphatically, not a weaver. "Sheila is an artist who works with fiber, line, and color," says Louise Mackie, curator of textiles and Islamic art at the Cleveland Museum of Art. 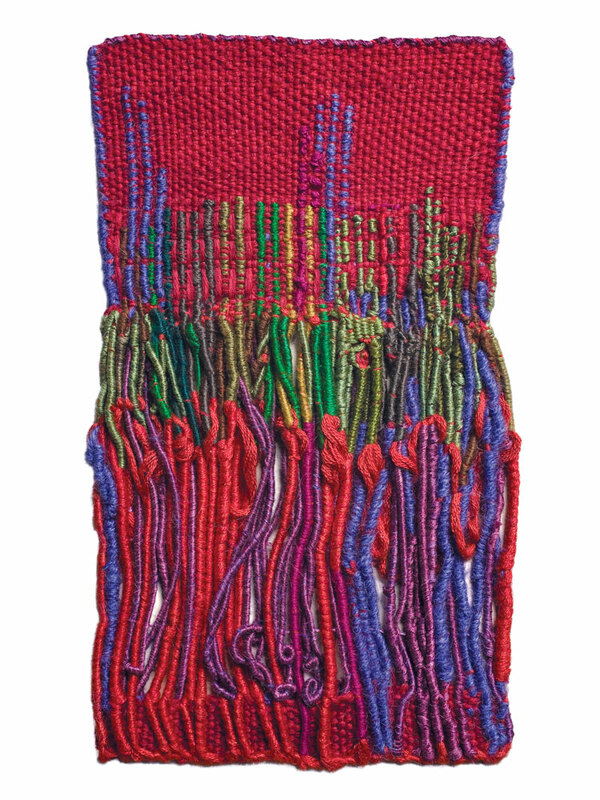 "This you can see by looking at her work: Her small woven works are in tapestry weave," a technique in which wefts dramatically outnumber warps, like a melody overwhelming harmony, "the equivalent of painting with colored thread." Hicks has a protean sensibility that seems to stir her to extremes: She tends to work in either a grand or diminutive scale and not so often in between. 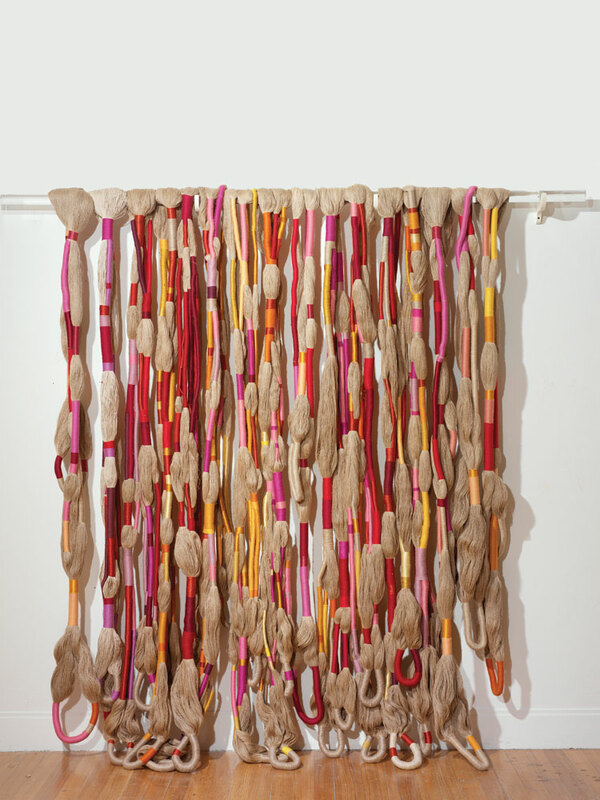 This summer, "Sheila Hicks: 50 Years" at Philadelphia's Institute of Contemporary Art traces the 76-year-old American's career through the lens of her woven works in what is, remarkably, her first major retrospective. (The show originated at the Addison Gallery of American Art in Andover, Massachusetts, and will move to the Mint Museum Uptown in Charlotte, North Carolina, in October.) Hicks makes paintings, drawings, sculpture, and photographs - and has studied all of those forms. But she works most intensively with fiber. "Noteworthy about Sheila's practice is her respect for different traditions," says art historian Whitney Chadwick, who wrote an essay for the exhibition catalog. "She rejects what is a common attitude among many ‘artists' that concept takes precedence over materials. 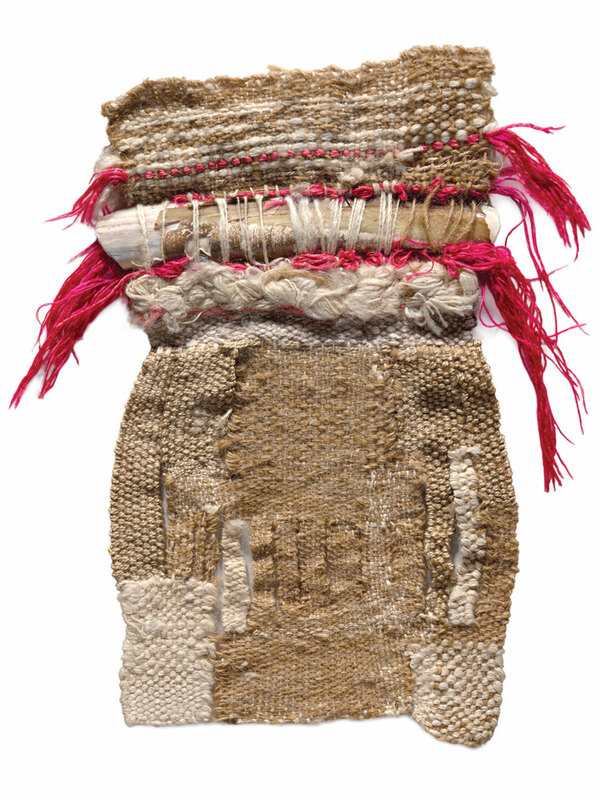 At the same time, her fiber works can never be reduced to aesthetics and techniques, though those things are certainly present." Materials have been one of the great protagonists of Hicks' creative output from the beginning. 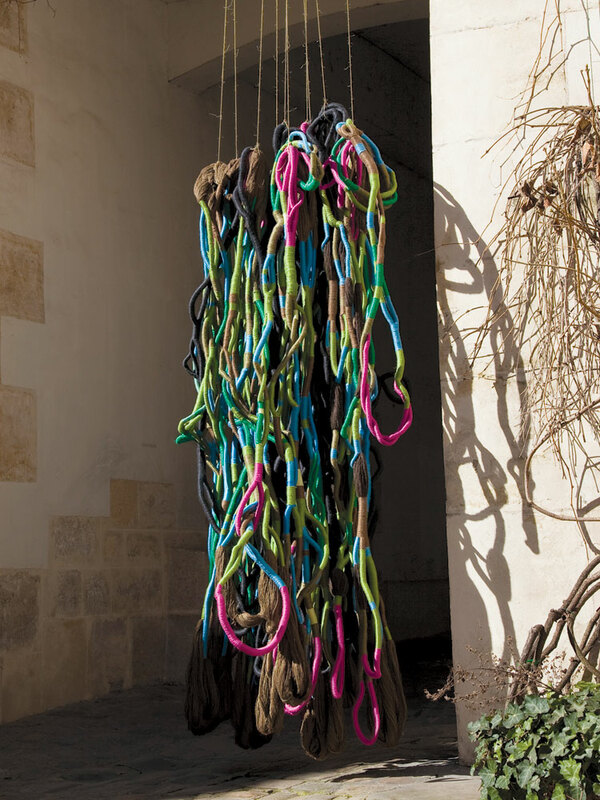 A year after earning her MFA in painting from Yale in 1959, she was already plucking found objects out of context and absorbing them into her ruminations: Clignancourt (1960) is a clutch of leather shoelaces, silk, and cotton; a cousin, La Clef (1988), is a knot of colored rubber bands. In Footprints (Rose) (1978), the fine knit of socks discarded by Carmelite nuns serves as her warp and weft. Hicks has co-opted everything from raw linen to hospital bedding, surgeon's smocks to nurse's tunics, natural cork to synthetic plumbing insulation tubes, stainless steel fiber to silk and human hair. 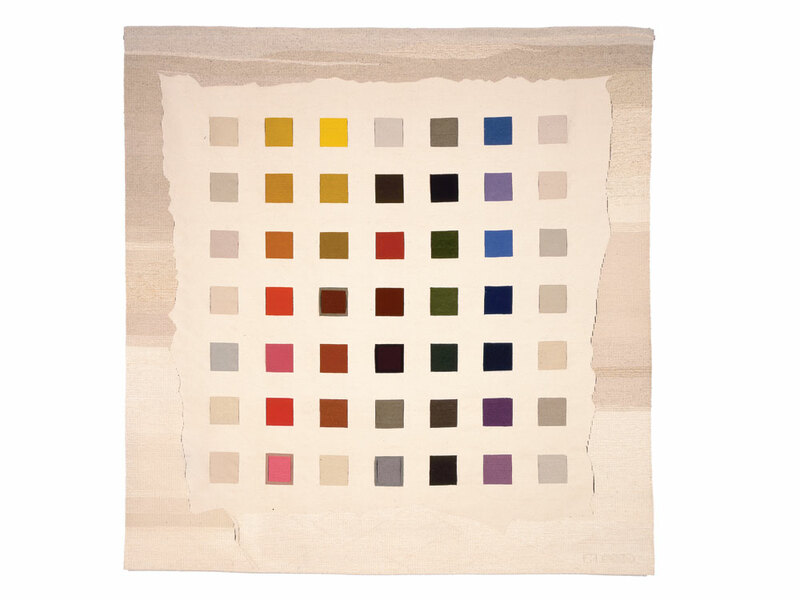 In the past, Hicks' large interior pieces have had a degree of uniformity in material and color that she would then abandon when it came to pattern and texture. 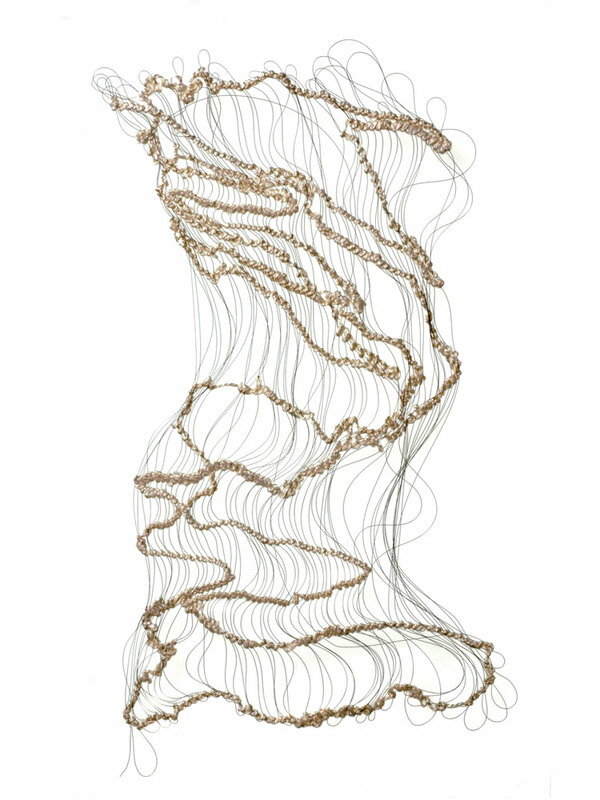 Today, her installations drop the pretense of uniformity: They look tangled, like Prophecy From Constantinople (2008-10), vividly dreadlocked, like The Principal Wife (1968), or frizzy, like Eight Sumo Balls (2009), which has since morphed into an installation for Tony May's newest New York eatery, SD26. "Order, regularity, symmetry, repetitive patterns are often the basis of my designs for bas-reliefs," Hicks says, "and, once mastered and measured, I delve into their opposites." Even her miniature pieces, or minimes, assume the asymmetry of a photograph, a landscape's irregularity of color and texture, and all the unpredictability of real life recorded. The French word minime literally means "very small"; and though it also connotes "of very little significance," her miniatures are of the first importance to Hicks. 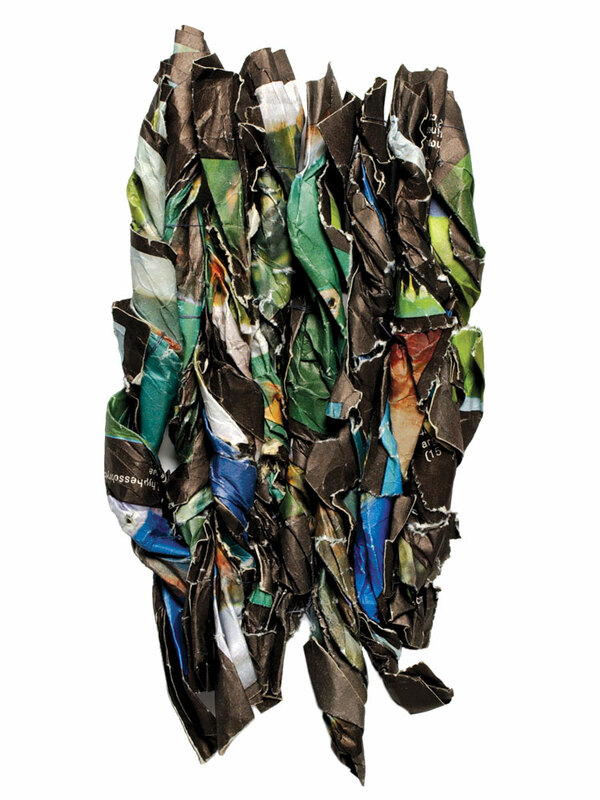 She uses them as studies, sketches, and material explorations: Roulade Amazone (1965), made of crushed, rolled, and sewn pages from a natural history book, explored a concept for larger sculptural pieces. 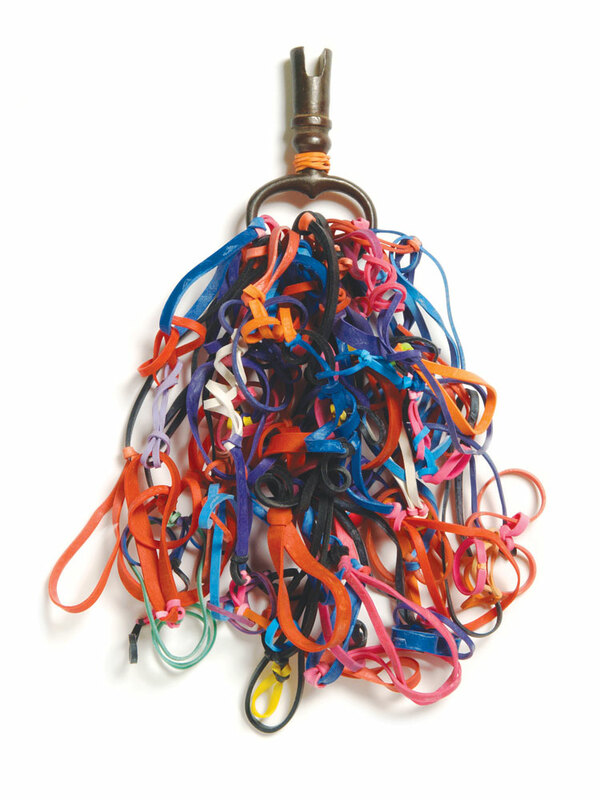 The minimes are also color experiments: Wrapped and Coiled Traveler (2009) juxtaposes crimson, emerald, and cerulean; the scruffy M'hamid (1970), pierced by a razor-clam shell, contrasts fuchsia and ecru; Wil Bertheux (1973) unites a punchy pink with sultry fields of scarlet and crimson. Narrowing stripes fade into beige in Vanishing Yellow (1964/2004), while the tapestry Color Alphabet II/VI (1988) lines up 49 "letters" on a white ground, square swatches of pigment that form the elements of Hicks' loudly unspoken language. " ‘Emotional and intuitive observation' might describe my methodology for working with color," Hicks explains. Being keenly observant is, perhaps, the legacy of an itinerant youth when Hicks moved, from her birth in Nebraska to college at Syracuse University, through at least eight Midwestern states. At Yale she studied color under Bauhaus veteran Josef Albers and audited Louis Kahn's architecture classes. Traveling on a Fulbright scholarship in South America, she befriended revolutionaries in Caracas and carried a 5-kilo sack of "sugar" over the border between Chile and Peru. Since settling in Paris in 1964, she has commuted to a second home in New York (serving in the early 1980s as the editor of American Fabrics and Fashion magazine). She was named to the ACC College of Fellows in 1983 and received the Aileen Osborn Webb Gold Medal in 1997 for consummate craftsmanship. 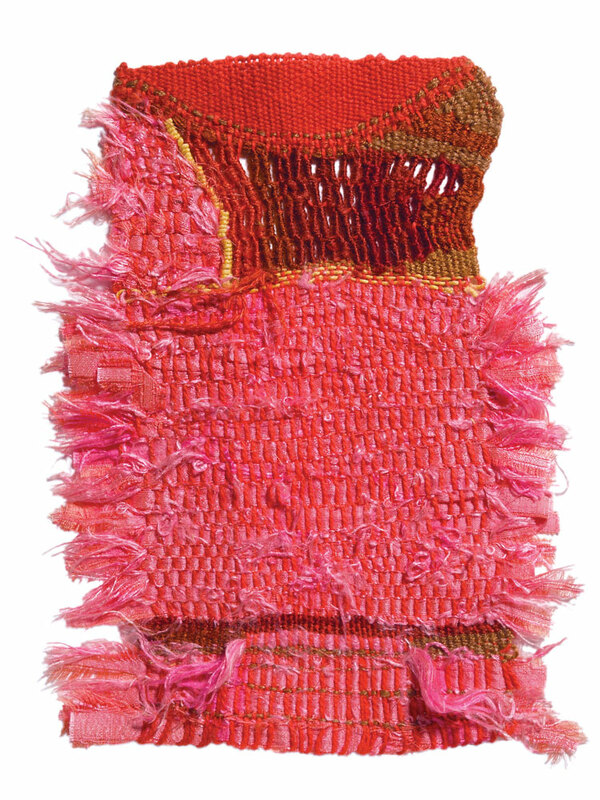 She has studied local weaving practices around the world, from Kyoto to Kabul, Tangiers to Tel Aviv, and Zagreb to Zurich. But wherever she has gone, in the world or in her art, she has simply never allowed herself to be tied down. Early on, as one of a handful of avant-garde midcentury artists working with fiber, Hicks kept "painting," but escaped the canvas. She moved tapestry from the wall to the center of the room, but escaped a visionary's egocentricity when her unsigned work was sold by retailers from Knoll to Crate & Barrel. And, as the minimes show, Hicks also escaped the grid of the warp and weft, showing that the two can be worked autonomously and still produce a coherent image. 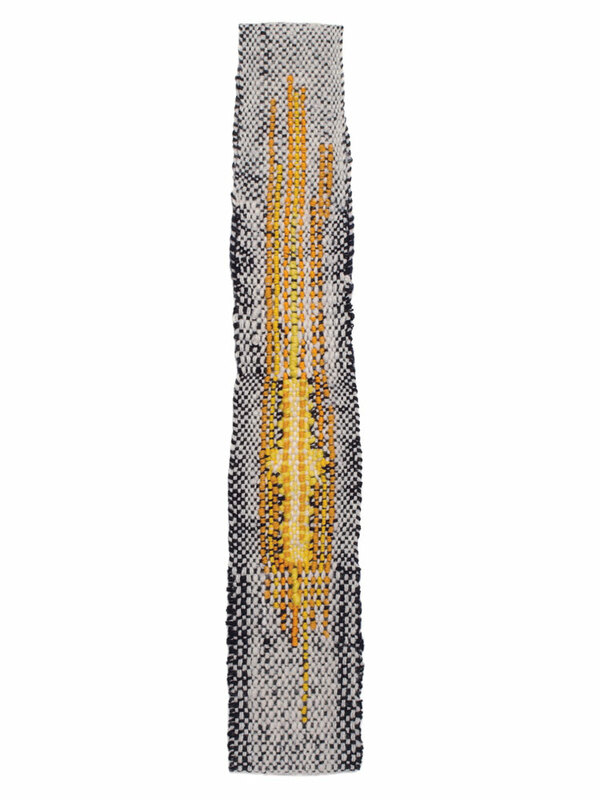 Like painter Lucio Fontana, who slashed canvases, Hicks opens incisions and passages in textiles or, by using a few strands of warp, leaves entire sections of weft exposed - sometimes slinkily, as in Promeneur (1988). The often unruly minimes have provided a cloistered space ­- in fact, the word also refers to a monastic order, where one seeks transcendence - in which Hicks studies how best to transcend convention. Evolution? The word is too linear to describe the multidirectional expenditure of Hicks' vast curiosity and vigor. Perhaps she experienced an evolution once, in the mid-1960s. During her early years in Paris, Hicks moved from the art world into the craft world, then into the design world. But she didn't settle in any of them. 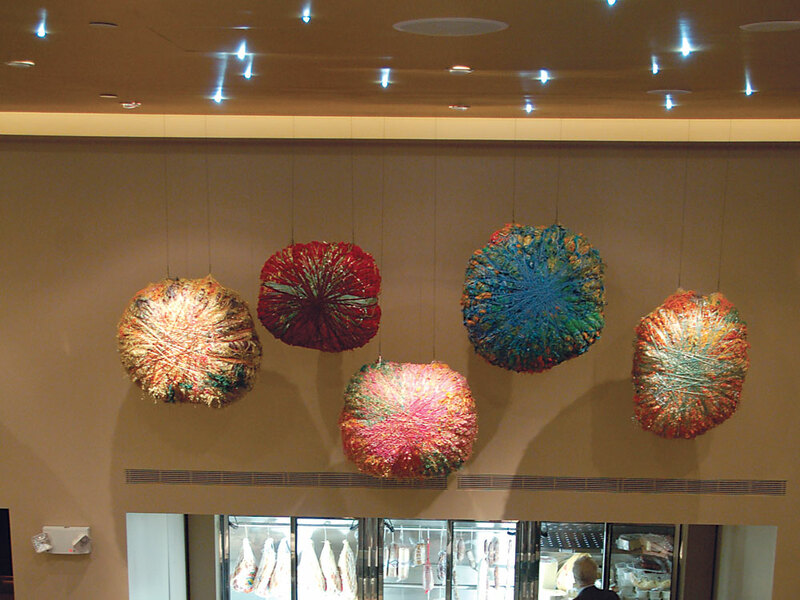 "Sheila Hicks: 50 Years" continues at the Institute of Contemporary Art, Philadelphia, through Aug. 7. It will be at the Mint Museum Uptown in Charlotte, North Carolina, from Oct. 1, 2011 - Jan. 29, 2012. Shonquis Moreno, a former editor for Dwell, Surface, and Frame magazines, writes about art and design from Brooklyn, New York.